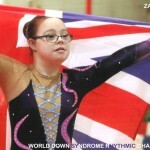 An outstanding result for City of Birmingham and GB Rhythmic gymnast Zara Turton with her performance at the World Down Syndrome Rhythmic Gymnastics Championships in the town of Mortara, Italy where she took the championship title to become the World Down Syndrome Rhythmic Gymnastics Champion 2015; a superb result for Zara and coach, Tracey Bedwell. 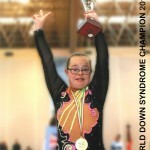 Both Zara and Tracey travelled with a team of 12 British gymnasts, their personal coaches and parents who accompanied the team. 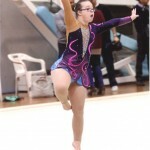 For Zara the reality of other disciplines working at the same time could have been a distraction but she remained extremely focused and able to retain concentration during the 6 event to perform her four routines and also gained three individual gold and one silver apparatus medal. 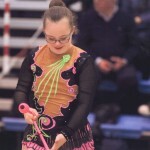 Zara’s final honour at the championships was to perform in the Closing Gala that evening with Olympic 2012 competitors, Rhythmic World Group Champions main stream and Italian national team members.